A motorcycle accident can be devastating—to say the least. When most people hear about a motorcycle accident, they often cringe in fear. This is because most motorcycle accidents are usually severe and deadly. What To Do After A Motorcycle Accident in Florida? Seek safety. Obviously if you are involved in a motorcycle accident, the first thing you should do after the impact is move yourself and your bike off the road or to safety—if you can, of course. If you are severely injured and don’t want to risk moving, then call for help or have someone nearby call for help. Call the Police. Once you’ve gotten yourself and your bike to safety, call the police—just like you would after a car accident. Much like a car accident, you need to report a motorcycle accident, too. Insurance claims are filed much the same way—especially since a motorcycle is a registered and insured vehicle. Having an accident report from the police will be necessary for the insurance company to have on file. Don’t Argue. If you were involved in a motorcycle accident with another party or vehicle, don’t argue with the other driver—even if you are scared, injured or worried. Heightened emotions are completely natural and typical after an accident, but they don’t solve anything. If another driver is responsible for your motorcycle accident, let the insurance companies duke it out. Stay out of it. Arguing can only harm your case rather than help it. Take Pictures. Again, if you are able, take pictures of the accident—including the damage done to both vehicles (including your own bike), your injuries, and even the accident scene itself. These pictures can help serve as evidence in your case later on. 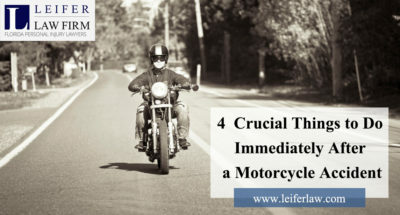 Of course the severity of your injuries will impact if you are able to do these things after a motorcycle accident, but these tips can help keep them in mind should an accident ever occur. Additionally, don’t ever feel like you have to deal with your motorcycle accident on your own. A motorcycle accident attorney is always available to help you file your accident claim with your insurance company, negotiate on your behalf with the insurance companies and other driver(s), and even help you to acquire a fair settlement.